What Started The Chicago Fire? Contrary to popular belief, it was not a cow kicking over a can. 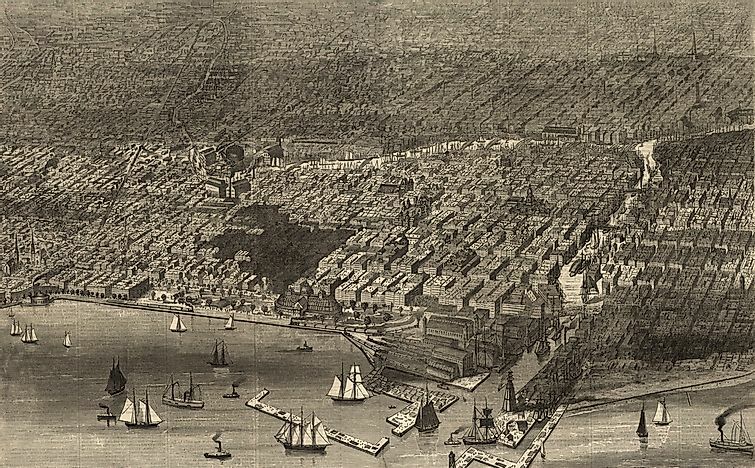 An image showering the burnt district of Chicago following the fire of 1871. The Great Chicago fire can be described as a blaze or massive fire that consumed a significant part of Chicago. The fire is said to have erupted on October 8, 1871, and lasted until Tuesday, October 10, 1871. The fire exterminated approximately three hundred individuals and ruined 3.3 square miles of Chicago Illinois leaving around hundred thousand occupants displaced. It burned an approximate area of 2,112 acres or 8.55 square kilometers destroying thousands of buildings and lampposts causing damages worth $222 million. Different myths explaining the source of the fire have been described. The most popular one is that a cow knocked over a lantern lamp and caused the havoc.The fire began at 9.00 p.m. on October 8 in a minor cowshed that belonged to the O'Leary family. Mrs. O'Leary's cow hit over a kerosene lamp, the shed caught fire, and it spread rapidly to the nearby shed. The shed was the first building to be destroyed by the fire. The fire quickly spread, and it became hard to control it since, by that time, most buildings in Chicago were made using woods. Roughly more than two-thirds of the buildings in Chicago were built entirely using wood while the rooftops were constructed using a highly flammable shingle. The city had only received 2.5 centimeters of rain for the four months before the fire. The lack of rain led to a severe drought that contributed to the significant spread of the fire. Strong winds from the southwest also significantly contributed to the spread of the fire to the core of the city as the winds carried flying sparks to the nearby buildings. By this time (1871), Chicago city had only 185 firefighters with only 17 horse-drawn steam engines. When the Chicago Fire Department received news about the fire, they responded immediately by sending in a team to deal with the havoc. Their quick response did not, however, bear any fruits as the firefighters were dispatched to the wrong place by Matthias Schaffer who was the watchman of the department by then. The error gave room for the fire to grow bigger and spread extensively. By the time the firefighters were locating the exact place of the fire, it had already spread too far, and the 185 firefighters with their 17 engines could not handle the fire. When the fire seemed to get out of control, Roswell B. Mason who was the Mayor asked the neighboring towns for assistance as the fire was getting close to the heart of the city. It was already too late as the fire burnt even the courthouse making Roswell order the freeing of prisoners. The local firefighters continued fighting it until the city's waterworks was burnt down. With this, the city's only hope of water ran dry, and the town became helpless. The fire only came to a stop on October 10, 1871, when the rains started. With the help of the rain and the firefighters, the fire was finally extinguished. There are also some myths that claim the fire might have been started by a meteor while others believe it was a human error. There is no known exact course of the fire, but since then, Chicago learned their lesson and till now they have put up strict measures to deal with such attacks in case they ever happen again. Did You Know That The Great Fire Of London Only Killed 8 People?